The Tambopata National Reserve is a 3.7 million acre protected area in southeastern Amazonian Peru. This reserve protects the biological diversity of the entire watersheds of the Tavara and the Candamo Rivers and most of the watershed of the Tambopata River. It protects habitats ranging from the Andean highlands around the rivers' headwaters through some of the last remaining intact cloud forests to the lowland rainforests of the Amazon basin. Over 650 bird species including 25 parrot species, 200 mammal species, 90 frog species, 1,200 butterfly species and 10,000 species of higher plants are protected within this reserve. The Tambopata Research Center is situated adjacent to the world's largest known clay lick, or "colpa." This offers a unique opportunity to observe one of the world's most colorful wildlife spectacles. 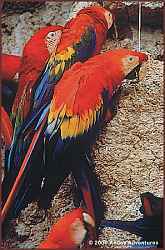 More than a dozen parrot species and Macaws come here to nibble on the clay, a vital but mysterious part of their diet. The Tambopata Research Center is an excellent headquarters for in depth explorations of Amazonian nature and wildlife. *Select the program you want. Andes Adventures will reserve any Rainforest Expeditions program at NO additional cost. We will coordinate your flights & transfers and make the payment to Rainforest Expeditions.